By day, the shop runs as a retail outlet and by night it transforms into a tasting bar for wine, gin, sparkling wines, vodka, draft beers and ales. The unique Friday night tasting events, as well as bespoke private tastings, are very popular, lots of fun and completely different to other tastings guests have experienced. These relaxed, informal and friendly tastings are very sociable events giving customers more of a wine bar experience than a formal tasting session. Customers enjoy the fact they can sample different drinks that they may have never even seen before! Tastings are always accompanied by Lucy’s excellent cheese platters, with guests picking up knowledge and tips of the featured wine, spirit, ale or beer from Dave throughout the evening. Dave and Lucy work hard at sourcing and sampling new products for their customers to enjoy at their tastings. There’s so much more to Ingatestone Wines than just their fabulous wine! It is more about the experience than just about making a purchase. This family run business is like an extension of the whole Whittaker clan. They provide an array of services and gifts and Dave supports his clientele with a traditional and a good ‘old fashioned’ level of personal service – always on hand to offer advice or guidance on any new purchases, matching wine with food for the evening or make recommendations based on the customer’s particular tastes. Dave and Lucy are passionate about their wine shop and this shines through in the exceptional service they offer. 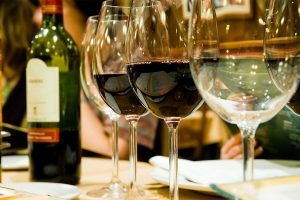 Why not try a unique Friday Night Tasting evening at Ingatestone Wines … the shop is transformed into an informal tastings bar for a relaxed and sociable evening where you can try a variety of wines, gin, fizz, vodka, beers & ale. Please email or call us for an up to date programme of tasting events and to make a booking. Wine and Food Matching – A Dream or a Nightmare! Copyright Ingatestone Wines. Created by Kelly Designs © 2018. All rights reserved.